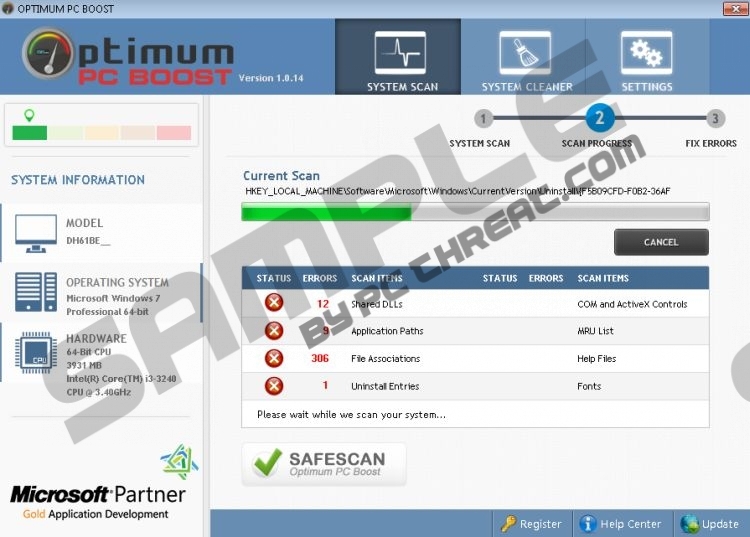 If you have downloaded and installed Optimum PC Boost on your system, you should know that there is no need to worry about the security of your system because this program is a completely legitimate application. It promises to boost your computer’s speed, clean various unwanted files from your hard disk, boost Internet speed, remove registry errors, and even protect your privacy. As you can see, there is no need to delete this program from the system; however, it is still advisable to be careful with this program if you have downloaded it from any random source that you have found on the web. As you can see, it is very important to download software from official websites. Even though this optimization tool is legal and there is no need to delete it from the system, you should know that it is not going to help you unless you buy its full version. The license costs $29.97; however, you might purchase some additional features accidentally if you do not unmark the checkboxes. As it can be seen, Optimum PC Boost has been published for commercial purposes only. Of course, it is not forbidden to buy its full version; however, keep in mind that you should delete the program entirely if you decide that you do not want to do that. You should better not keep Optimum PC Boost on your system if you are not going to buy the license. The reason is simple – the program might slow down your system a little bit because it uses your computer’s resources. In case you have downloaded this optimization tool from unreliable websites, you should know that it is advisable to get rid of such a version as soon as possible. Besides, you should not forget to scan your system with an antimalware tool because some malicious components might have already entered your system. If Optimum PC Boost seems as a useless program, you should know that you can delete it whenever you want to. As it is not a serious infection, you will not be able to remove it automatically, which is why we have provided the manual removal instructions for you. If you still have any questions regarding the removal of this program, you can leave them in the comment box below the article. Right-click on Optimum PC Boost and then select Uninstall. Right-click on the program that you need to remove. Quick & tested solution for Optimum PC Boost removal.